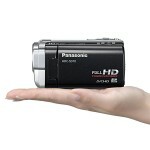 Panasonic has announced two of the world’s lightest HD camcorders. Weighing in at only a half-a-pound, the Panasonic HDC-SD10 and HDC-TM10 both produce 1920×1080 video and come with image enhancing features like O.I.S. (Optical Image Stabilizer), face detection, and AF/AE Tracking (Auto Focus/Auto Exposure Tracking). The difference between the two models is the way it records footage. The HDC-SD10 records video onto an SDHC/SD Memory Card. The HDC-TM10 also uses an SDHC/SD card, but can also record onto 8GB of built-in memory. The HDC-TM10 “twin memory” model also features Relay Recording. When one type of memory runs out, the camera automatically switches to the other available memory type. Both the HDC-SD10 and HDC-TM10 are scheduled to start shipping in September ’09. The camcorders will retail for $549.95 and $599.95 respectively. Thanks for the camcorders information. Got me thinking. Nice one. did they announce prices on these yet?